Bus from Singapore to Mersing is the most budget transportation to arrive at Mersing Jetty, before transferring to a ferry to reach the beautiful Tioman Island. Tioman Island is the paradise for beach lovers and diving lovers because of its crystal-clear waters and endless miles of fine sand beaches. Every year, there are thousands of tourists flocking to Mersing by bus because of the natural attractions in Tioman Island. 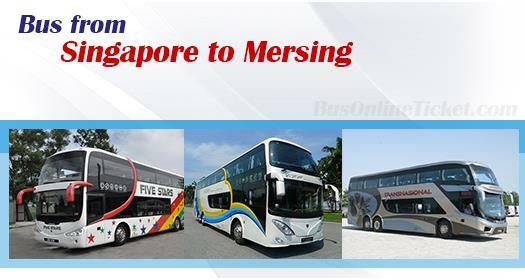 There are only two bus service providers offering the bus from Singapore to Mersing, namely Transnasional and Starmart. There are in total only 5 daily departures for this route, with 2 departures at 6:31am and 7:16am by Starmart and 3 departures at 9:00am, 7:30pm and 10:00pm by Transnasional. Transnasional coaches depart from The Plaza at Beach Road in Singapore while Starmart coaches depart from either Boon Lay Shopping Centre or from Golden Mile Tower. The arrival point, Mersing Bus Terminal, is 10 minutes walking distance away from Mersing Jetty. Bus Fare for bus from Singapore to Mersing is around SGD 33.90-35.00. The journey for bus from Singapore to Mersing is about 3.5 hours depending on traffic condition. Transnasional is the only operator who serves bus from Singapore to Mersing in the evening with departures at 7:30pm and 10:00pm. The coach arrives at Mersing Bus Terminal close to midnight. For travellers who plan to have an early arrival at Mersing 1 day before ferry schedule, Transnasional is the convenient option. Passengers can stay 1 night at a budget hostel in Mersing and catch the next morning’s ferry in a leisurely way. Ferry departure time is around 11:00am, depending on tidal condition. Planning to spend your next diving trip to Tioman Island, please book your ticket in advance online to avoid disappointment due to limited schedules per day. All online bookings made in BusOnlineTicket.com are instantly confirmed. This will secure your transportation to Tioman Island to enjoy your holiday.